Our Arizona dairy milk is one of the freshest, most local products you can purchase daily. In my role with the Arizona Farm Bureau, I’m regularly asked how to “buy local.” I always say the best place is in the dairy case of your local grocery store. There, not only will you find branded local dairy product like Shamrock and Danzeisen Dairy, but the rest (though not specifically branded) is coming from our local dairies, minus about 3%. That gallon of milk you pick up on a regular basis for your family is local, from our own Arizona dairy cows. That small 3% that might not be local is typically organic from out-of-state. Remember, local is more important to our economy than organic. Finally, our dairy industry is currently our largest agricultural commodity in the state. Our state represents some of the most modern, state-of-the-art dairies in the country. The story of our dairy farmers, their families, and our cows is special. Read on and you’ll see why. 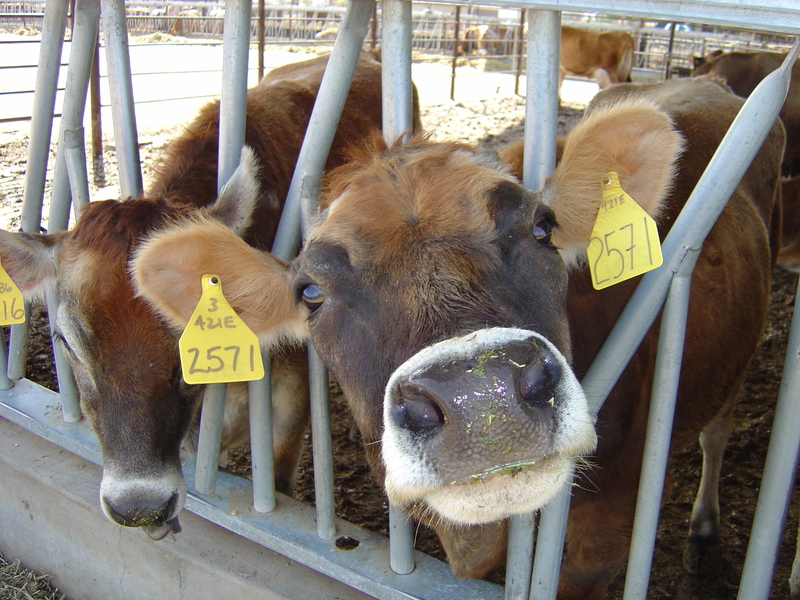 In fact, we answer for you some of our most frequently asked questions about our Arizona dairy cows. How Big is Arizona’s Dairy Industry? Dairy rotates with beef at the top of our $23 Billion agriculture industry in Arizona. In 2018, Dairy beats out beef as the biggest agriculture commodity with $721 million in “cash receipts,” according to the United States Department of Agriculture. How many active Dairy Farms are in Arizona? Just under 100 family-owned commercial dairies. What’s the largest & smallest operation? Compared to the Midwest, even the smallest dairy is Arizona is large. Our largest dairies can run about 10,000 active milk cows. Our smallest dairy farm is 850 milking cows. In the Midwest, it’s not unusual for a dairy to have no more than 150 cows. How they raise their herd? With the latest nutritional and technological innovations in dairy cow management. Today’s dairy cows even have pedometers attached to each cow so farmers can track every step a cow takes. The data is uploaded every 15 minutes and a farmer, based on a cow’s activity, can determine exactly what’s happening with her. The data also allow them to predict problems. What breeds are best? The two most common breeds are the Holstein and Jersey in Arizona. Jersey cows have a higher fat content. Holstein is the most common breed and is known for its black-and-white spots. How old before they start producing? On average, dairy farmers usually aim for their heifers to become pregnant at around 15 months of age so that they give birth when they are around two years old. A cow must be in lactation in order to give milk, so a milking cow must give birth to a calf each year. How much can a cow produce in a day? It varies, but about 10 gallons a day. Another way to look at it: milk production per cow averages approximately 24,000 pounds per year, and she can be milked 305 days per year. This is approximately 75 pounds daily, which averaged 2000 pounds per month, or 465 ½ gallons per month. Ultimately, a healthy cow will produce 15,000 to 18,000 gallons of wonderful milk in a lifetime. A cows udder can hold 25 to 50 pounds of milk. How many years will a good cow produce? 5 to 7 years. How many gallons does that equal over the life of the cow? 15,000 to 18,000 gallons in her lifetime. What kind of feed do dairy cows require? I’ll leave that to a nutritionist. But in general, a typical cow needs 100 pounds of feed each day of a combination of hay, grain, silage and proteins, vitamins and minerals. Dairy farms contract with nutritionists to prescribe just the right diet. And, it’s different for every stage of a dairy cow’s life. They eat better than you and me. One dairy farmer told me every bite counts and that they “feed for health.” The outcome is amazing milk production. The put this in understandable terms, a cow that eats only grass produces about 50 glasses of milk a day. A cow that eats grass, corn, and hay, mixed with nutrients like vitamins and minerals, can make about 121 glasses of milk a day. What is done with all the manure? Dairy farms are daily managing manure including cleaning their pens. They recycle the manure for compost and other purposes. Some even employ methane digesters that can produce methane gas to generate electricity. From Cow to Cup of Milk – The path of the milk from the cow to the grocery store. The many steps begin with milking the cows and storing the milk in stainless steel storage containers that immediately chill the milk to 39 degrees Fahrenheit. Milk is collected from the farm every 24 hours in large tankers that keep the milk cold during transportation. At the processing, plant milk is pasteurized and homogenized before packaging to get ready for the grocery store. Where is the milk pasteurized and what does that mean? At a milk processing plant. In Arizona, one example is the United Dairymen of Arizona, a Co-op owned by the family dairies. At this facility, the milk is pasteurized and bottled. Pasteurization is the process in which packaged and non-packaged foods are treated with mild heat (<100 degrees Celsius) to eliminate pathogens and extend shelf-life. The process is intended to kill pathogenic bacteria and make food safe to eat. What’s the difference in whole, 2%, & skim milk? The amount of fat is the only difference between them. Half the calories in whole milk come from fat and one-third of the calories in 2 percent milk come from fat. Only 1 percent milk and skim milk are truly low-fat milks. How is the expiration date calculated and how long after the expiration date is milk still ‘good’ for? If you can store your milk for about five days after the sell-by date, subtract the current date from the sell-by date, add five, and you have the number of days your milk will be good for. For example, if I buy milk today that has a sell-by date of Aug 27, it will be good for 15 days, or a little over two weeks. Of course, the nose test works too. What brands to look for to know you are supporting local dairy farms? 97% of the milk sold in our Arizona grocery stores comes from our family dairies. We have our well-known family local brands such as Danzeisen Dairy and Shamrock Dairy. But that gallon of whole milk you just bought this week also came from a local dairy, it just doesn’t have the farm dairy brand slapped on the side of the package. For more fun and interesting articles, check out the Fill Your Plate blog. New articles are posted weekly. Or if you’re looking for some wonderful dairy related recipes, check out the Fill Your Plate Recipe section. Sources: Arizona Farm Bureau, United Dairymen of Arizona, Arizona Milk Producers and Arizona’s dairy farmers. This entry was posted in Animals, Arizona, Arizona farmers and ranchers, Arizona Food Prices, Cooking, Dairy, Diet Tips, Farm Facts, Farm Humor, Fill Your Plate, Focus on Agriculture, Food, Food Facts, Grocery, Health Tips, Healthy Eating, On the Farm, Produce, Recipes and tagged Arizona, Commodity, Cow, dairy, facts, Fun, Largest, local, milk, Sour cream, yogurt. Bookmark the permalink.